Hans sat on the edge of his turret hatch looking east through his binoculars at the horizon. To his left a PzIIIG , a PzIVE and a PzIIF slightly staggered back from his position. Just to his right,set back a bit, a second PzIVE in support. The next tank in the row was his 2nd in command Franz. Franz was in a PzIVH like himself, up front, in line with Hans. He sat smoking a British cigarette, looking at his flank of tanks arcing back to his right. Waiting for orders were 2 PzIIIG & an other PzIIF. The day was still very hot with the sun low and bright behind them. Hans called to Franz via radio and joked that the Tommies must have gone for a late tea. No one would attack into the sun this late. Franz lifted his own binoculars as he laughed stopping quickly to yell “TANKS” into his mike. 12 new Stuart tanks from America rushed forward, 6 left & 6 right. 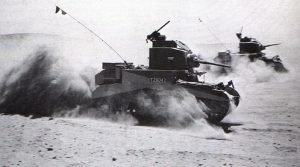 The speed of the new “Honey” tanks rushed them into prime range of the panzers. PzII’s scratched the paint off the bold swarm & PzIV’s bounced HE (no supplies of AP being available) off the Brit armour with no effect. The PzIII s were a different story lighting up 1 each flank and 2 kills per side. ROF and Intensive fire from the veteran German gunners being rewarded with 3 CH & a Malf. The German 1/2 of turn 1 and Brit part of turn 2 saw 5 more “Honeys” die with 2 on fire. With their last Stuart immobilized the British threw up their hands. Their war was over. Eldon was diced like cheese at a social. I had 4 or 5 snakes, good ROF, a pile of IF shots with no ill effect.